Several health articles of interest are found at the end of this page. The expression Hip Dysplasia (HD) can be interpreted as the abnormal or faulty development of the hip. Abnormal development of the hip causes excessive wear of the joint cartilage during weight bearing, eventually leading to the development of arthritis, often called degenerative joint disease (DJD) or osteoarthritis. The terms DJD, arthritis and osteoarthritis are used interchangeably. HD is a developmental disease meaning that it is not present at birth, but develops with age. Studies show a connection between excessive laxity and the development of DJD. Generally, HD is considered to have a genetic base; giving the dog a predisposition to the way its hips are formed at birth and how much laxity is present in the joint. However, studies show that environment plays a large role as to whether DJD sets in. Dogs that may be predisposed to DJD may not develop symptoms unless the dog has certain environmental influences. Proper nutrition and the avoidance of obesity are critical. Extensive or inappropriate exercise can also damage growing joints. 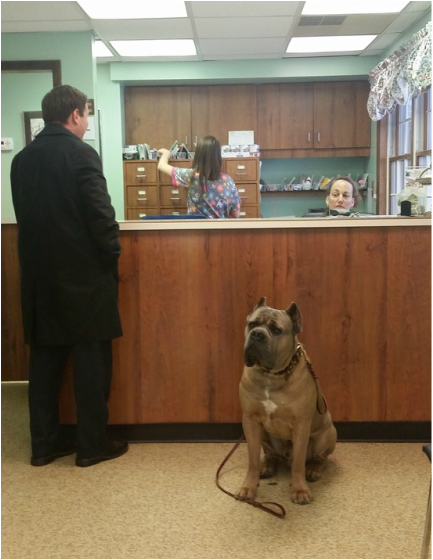 The Cane Corso owner should be fully aware that HD is fairly common in the breed, therefore owners and breeders alike should understand how to best prevent it from presenting. Seizure disorders are not uncommon in canines. Though there are many reasons dogs can suffer from seizures, ranging from trauma, to brain tumors, to exposure or ingestion of toxic materials, perhaps one of the most frustrating conditions is idiopathic epilepsy. Idiopathic means that the cause of the seizure is unknown. Idiopathic epilepsy becomes the diagnosis after a veterinarian tries to test for and rules out other causes. Blood and urine tests are usually done to determine if any toxins are present. Severity varies as some cases can be controlled with drug therapy such as Phenobarbital, Potassium Bromide or Levetiracetam, while others sadly cannot. Unfortunately, there is currently no genetic test to determine carriers of this condition nor is there concrete evidence pointing to what the genetic correlation is. In the Cane Corso, idiopathic epilepsy onset usually occurs around the age of 2 years old, though may be seen as young as 9 months, and as late as 5 years old. If your dog experiences a seizure, use caution in approaching him or her during and immediately after an episode. Post-ictal (the time after a seizure), dogs may experience extreme disorientation and blindness. They may seem afraid and possibly aggressive. This condition may last anywhere between a few seconds to 20 minutes or more. Though you will want to comfort your friend, it is important to give them a little space until you are certain they are feeling themselves again. Demodicosis is a condition seen in both dogs and cats and is caused by different species of Demodex mites. It is interesting to note that Demodex mites are found on the skin of all normal animals, including people, and usually exist in small numbers within the hair follicles. Demodex mange is therefore not considered contagious since all animals have these mites. Animals are not born with these mites but acquire them from their mothers in the first few days of life, during the nursing process. If Demodex mites are present on all animals, why do some animals develop demodectic mange and most do not? Animals with Demodex mange may have an inherited or acquired immune defect that fails to keep the numbers of mites in check. The result is a mite population explosion which not only crowds the hairs within the hair follicles and results in bacterial infections, but the mites produce other substances that then compromise the immune system and perpetuate the infestation. The proliferation of mites is therefore an effect, rather than a cause of the condition. Our attention should always be focused on the cause of the immune deficit rather than merely how to get rid of the mites. In young animals, which are most commonly affected with Demodex mange, the condition likely reflects an inherited incompetence of the immune system. However, emotionally trying situations (i.e. shipping) and hormone fluctuations (i.e. first heat cycle in females) in growing dogs can cause an outbreak of Demodex mange. These temporary stresses to the immune system, once removed, return the dog to good health. There are two forms of Demodex mange, localized and generalized. Localized demodicosis only occurs on the face and the front legs or toes in small patches. This type of mange can be stress-induced as in the examples mentioned above. Generalized demodicosis occurs all over the dog and is considered the most serious form as it signals a true problem with the animal's immune system. Symptoms of Demodex mange include red, itchy patches where the hair is missing. A skin scrape is done by the vet to check for the presence of mites. Treatment for both forms of Demodex mange involves dipping the dog with Mitaban, although holistic treatments are also available. The Cane Corso is a breed of mastiff and thus has eye problems common to its other molosser relatives. The most common defects are entropion, ectropion and glandular hypertrophy ("cherry eye"). Entropion is the inward curling of the eyelid so that the lashes scratch the cornea and cause irritation and eventual scarring and ulceration. It occurs when the eyeball is too small for the socket and the lids roll in toward the eye. Symptoms include red, irritated eyes, tear stains on the face and constant watering of the eyes. Entropion is hereditary (a dominant autosomal gene) and usually affects the lower lid, but the upper lid may also be affected. One or both eyes may have the condition. Surgery is required to correct the lid and save the cornea from scarring. Ectropion is the opposite of entropion and involves the lower eyelid rolling out, exposing the sensitive tissues beneath. The exposed tissue of the 3rd eyelid often becomes inflamed and infected, causing a condition known as "exposure conjunctivitis." Dogs (especially those with heavy facial wrinkles) are either born with it or it may occur as the result of an injury or scarring from previous surgical procedures. The sad look of the Basset Hound, Bloodhound and the Saint Bernard is due to this condition. Often in the correction of entropion, some degree of ectropion occurs. Ectropion may even occur in conjunction with entropion where the upper lid rolls in while the lower lid droops down. Though unattractive, ectropion is not dangerous to the dog’s health unless infection occurs. Cherry eye is when the gland of the 3rd eyelid becomes inflamed, swollen and protrudes from the lower lid; the condition is known as glandular hypertrophy. It is often referred to as "cherry eye" due to its resemblance to the fruit. It can occur in one or both eyes and usually occurs in dogs under one year of age. It can be quite frightening to a pet owner when seen for the first time. The most successful treatment is to remove the gland. Surgically reposition the gland and tacking it down often is unsuccessful and many times the gland has to be eventually removed. Dystichiasis is a disorder defined as the abnormal growth of lashes on the inside of the eyelid. Generally, this condition comes and goes and isn’t much noticed by the average owner outside of the dog’s eye tearing excessively. Other symptoms include inflammation, other discharges and excessive blinking. The dog may also squint or keep the sore eye tightly closed or rub or paw at the eye. In more severe cases, corneal ulcers can develop; the affected part of the cornea often appears bluish and may be less shiny in appearance. With chronic or long-standing distichiasis, a dog may develop corneal scarring; drops or ointments may be used to prevent this. Bloat is a serious, life-threatening condition of large breed dogs. While the diagnosis is simple, the pathological changes in the dog's body make the treatment complicated, expensive and not always successful. Large, deep-chested dogs that usually eat once a day and are in the habit of bolting food, gulping air, drinking large amounts of water immediately after eating and exercising vigorously after eating are more prone to bloat than others. Simple gastric distention can occur in any breed or age of dog and is common in young puppies that overeat. This is sometimes referred to by laymen as pre-bloat. Belching of gas or vomiting food usually relieves the problem. Clearly, prevention is wisest. Feed two meals daily and discourage rapid eating. Do not allow vigorous exercise for two hours after a meal. Symptoms include looking back at the stomach and signs of obvious pain. The belly will look swollen. Immediate surgery is required to save the dog's life by untwisting the bowels and relieving the pressure caused by gas buildup. Articles will open in a separate window in PDF format.